After the abortive Jacobite invasion of England, the army of Prince Charles Stuart had withdrawn to Scotland and besieged Stirling Castle. 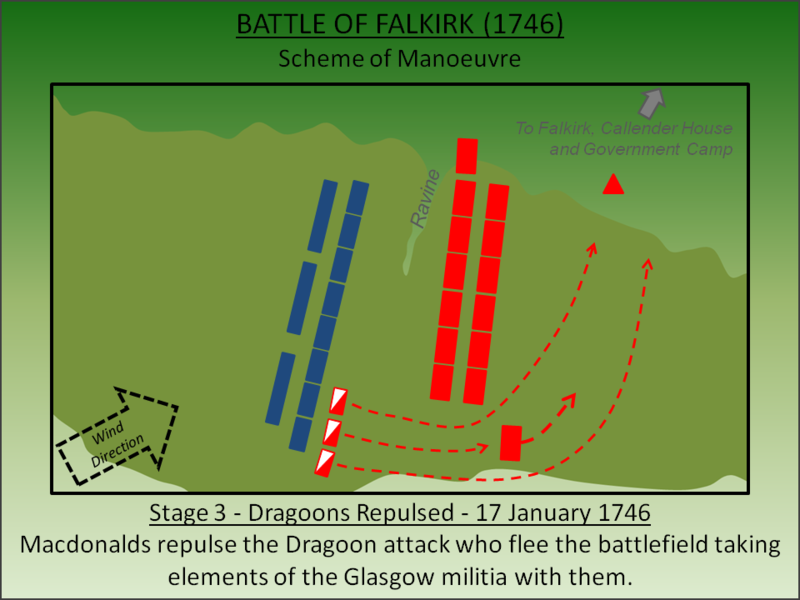 Awakened to the threat posed by the rebels, the Government dispatched battle-hardened British troops from the continental war but they would be defeated at the Battle of Falkirk (1746). The Jacobite rebellions were a consequence of the Glorious Revolution that had overthrown the Catholic James VII (II of England) and the ruling Stuart dynasty. In their place William of Orange, along with his wife, Mary Stuart (daughter of James VII) had been invited to take the throne. William landed with his army at Brixham on 5 November 1688 starting a popular uprising that saw support for the Stuarts collapse. Nevertheless whilst Protestant England embraced the new monarchs, reaction in Scotland to the new regime was mixed. Although the Scottish Government supported William and Mary, amongst both Protestant and Catholic circles there was reluctance to displace the Stuart dynasty which had ruled Scotland for over 300 years. In April 1689 the first Jacobite rebellion started led by John Graham, Viscount Dundee. Supported by Irish troops and Highland clans he had military success at the Battle of Killiecrankie but was killed in the effort. A number of further battles were fought but the uprising was ultimately defused when on 27 August 1691 the Government offered a general amnesty to any clans who had participated provided they took an oath of allegiance. The associated massacre of Glencoe in February 1692 did much harm to this attempted reconciliation. William died in 1702 (Mary had passed away in 1694) and was succeeded by Anne, another daughter of James VII. Her reign saw the Act of Union (1707) merging the Governments of England and Scotland whilst the Act of Settlement (1701) formally barred any Catholic from the throne – both measures were opposed by many Highland clans. So to was the succession in 1714 of the first of the Hanoverian monarchs, George I, whose eligibility came from descent from Elizabeth Stuart, a daughter of James VI. Discontent turned into war in 1715 with a new Jacobite rebellion although this was quickly crushed whilst a third rebellion in 1719 was defeated at the Battle of Glenshiel. Extensive construction of roads and military installations commenced to ensure the Highlands would finally be pacified. By 1744 the Union had seemingly failed to deliver economic benefits to the Highlands and a number of circumstances had put severe pressure on the clan structure. Concurrently war broke out between Britain and France; the latter sought to ignite a new Jacobite rebellion and planned to synchronise that with an invasion of Southern England headed by Prince Charles. But fortunes of war intervened and the French stalled their support. Frustrated by this inaction, Prince Charles fitted out two ships under the pretence of a routine privateering mission. With a frigate called Du Teillay and a man-of-war, the Elisabeth, he sailed for Scotland in early July 1745. The Royal Navy’s HMS Lion intercepted the Elisabeth and compelled it to return to port, but Prince Charles on the Du Teillay pressed on and on 23 July 1745 he landed on Eriskay in the Outer Hebrides. The initial reaction from the Government was muted. Whilst most of the British army was deployed fighting in Flanders, a force of 4,000 soldiers under Sir John Cope was deployed in Scotland to deal with any eventuality. He moved his force into the Highlands but, faced a confusing intelligence picture, opted to march on Inverness. But his actions left central Scotland undefended and Prince Charles capitalised on the error; on 17 September he entered Edinburgh proclaiming his father James VIII of Scotland. Realising his mistake, Sir John moved his force towards Aberdeen and then, by sea, to Dunbar. He moved his force towards Edinburgh but his raw recruits were defeated at the Battle of Prestonpans on 21 September; his entire army was decimated with over 1,500 soldiers being taken prisoner. The battle awoke London to the threat and prompted the recall of Prince William Augustus, Duke of Cumberland and his army from Flanders. On 1 October Field Marshall George Wade, who had been recalled earlier in September as the situation had deteriorated, was ordered to take position in the north and duly marched to Newcastle in October. On 3 November 1745 the army of Prince Charles invaded England. With Wade at Newcastle the Jacobites invaded via Carlisle ironically benefiting from the road network Wade had built in order to suppress the Highlands in the proceeding decades. By 4 December the Prince had reached Derby having skilfully manoeuvred around the armies of both Wade and Cumberland. London lay open to his attack but, for the first time since returning to Britain, Prince Charles failed to convince his Council of War. Led by Lord George Murray, the Jacobite commanders feared being hemmed in by the armies of Wade and Cumberland as well as any force raised within London itself. On 6 December 1745, just two days after their arrival in the city, the Jacobite army retreated from Derby resolved to march north back into Scotland. Arriving at Carlisle Castle the Prince received word that French reinforcements were on the way and left a garrison installed ready for a future advance into England. The bulk of the army continued their retreat north compelling Glasgow to re-provision them. Whilst London had been taken by surprise by the defeat at Prestonpans, the recall of experienced troops from the continent gave the regime confidence the Jacobite army could now quickly be extinguished. Within days of the Prince leaving his garrison at Carlisle, the castle had been besieged by Cumberland who brought up heavy artillery from Whitehaven compelling the garrisons surrender, without terms, on 30 December. With the country now deep in Winter, Cumberland himself returned south to await the new campaigning season leaving his deputy, Lieutenant General Henry Hawley, to pursue the Jacobites into Scotland. On 3 January 1746 the Jacobites marched out of Glasgow intent on taking Stirling Castle which remained in the Governments hands. Hawley now moved to relieve the siege merging his force with that of General Wade. The consolidated army moved to Edinburgh and by 15 January was camped at Falkirk. 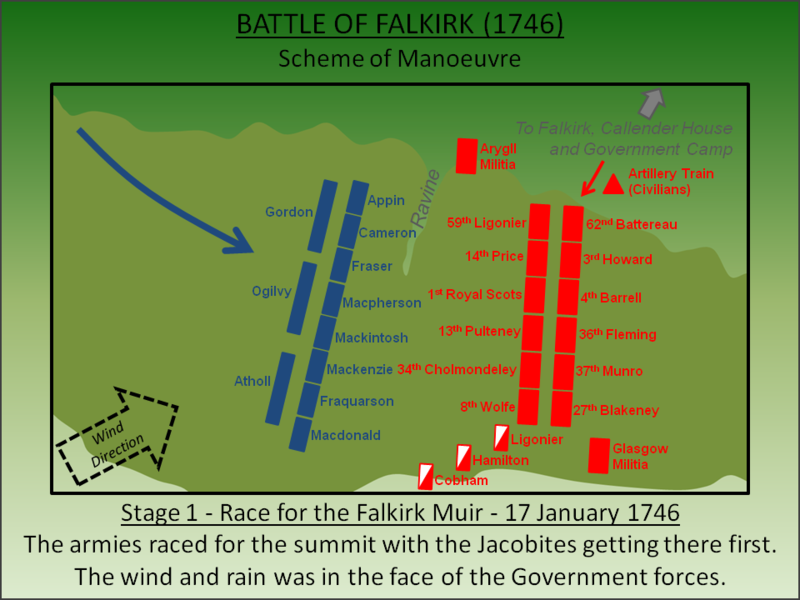 The Jacobite commander, Lord Murray, had expected an attack and deployed for battle on both 15 and 16 January but Hawley's forces remained in their camp. The Jacobites had a force of around 7,800 men which was slightly larger than the Government army although the bulk of their troops were experienced soldiers fresh from the continental war. Hawley also believed that his disciplined force, which was capable of firing two volleys per minute, would defuse and defeat any Highland charge. 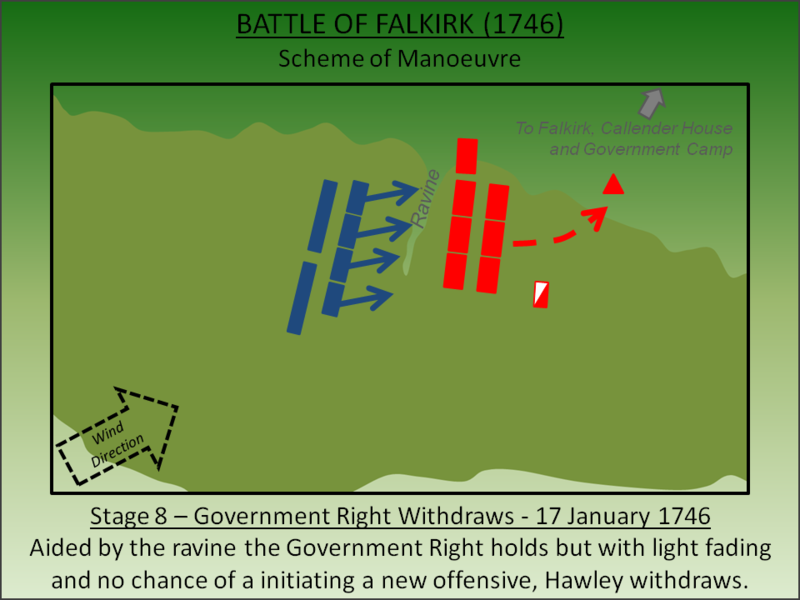 On the morning of 17 January 1746 General Hawley had surveyed the ground from Falkirk Muir, where the battle would later be fought, and considered no hostilities would take place that day. He then retired to a formal lunch at Callender House, within the town, with Lady Kilmarnock. Lord Murray now seized the initiative. 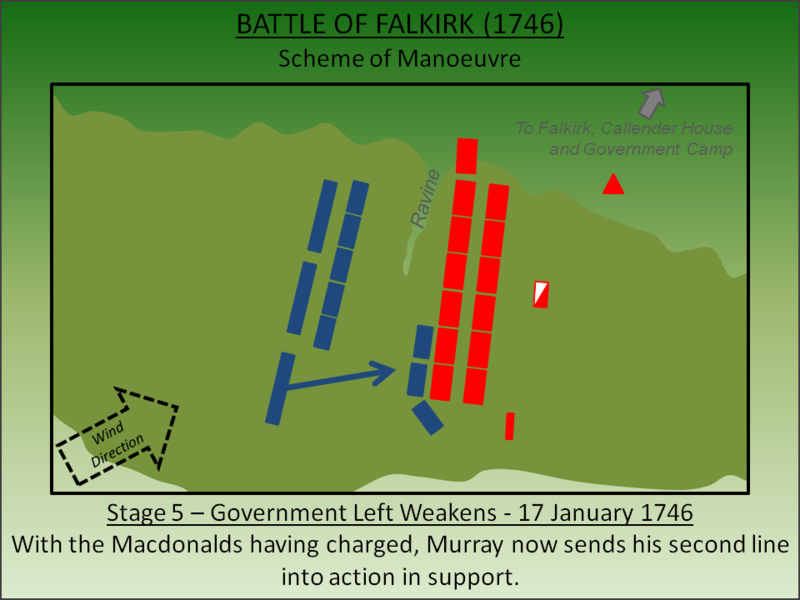 Murray moved his force towards the high ground on Falkirk Muir. With the wind on their backs as they made the ascent, they had arrived on the summit with their powder dry and in good spirits. With the exception of a deep ravine that was in front of Appin’s men on the left of the Jacobite line, the ground was ideally suited to the Highland charge. Murray deployed his army in two lines. From left to right his front line consisted of Appin's men, Cameron, Fraser, Macpherson, Mackintosh, Mackenzie, Farquarson and Macdonald. His second line was his strategic reserve consisting of the Gordons, Ogilvy and Atholl. Concurrently, having been alerted to the danger, Hawley hastily returned to camp and commenced moving his forces up towards the ridge. Everything was now against them - not only did they have a steep climb but the wind, with squally showers, was blowing in their face during their ascent. By the time they reached the top their powder was wet and the soldiers demoralised. Moreover the government artillery, which was being hauled by civilian contractors, was bogged down at the bottom of the hill. Hawley hastily deployed his force placing his inexperienced militia on the flanks of his army and, due to the ravine on his right, his three Regiments of Dragoons – under Ligonier, Hamiliton and Cobham - on his left. 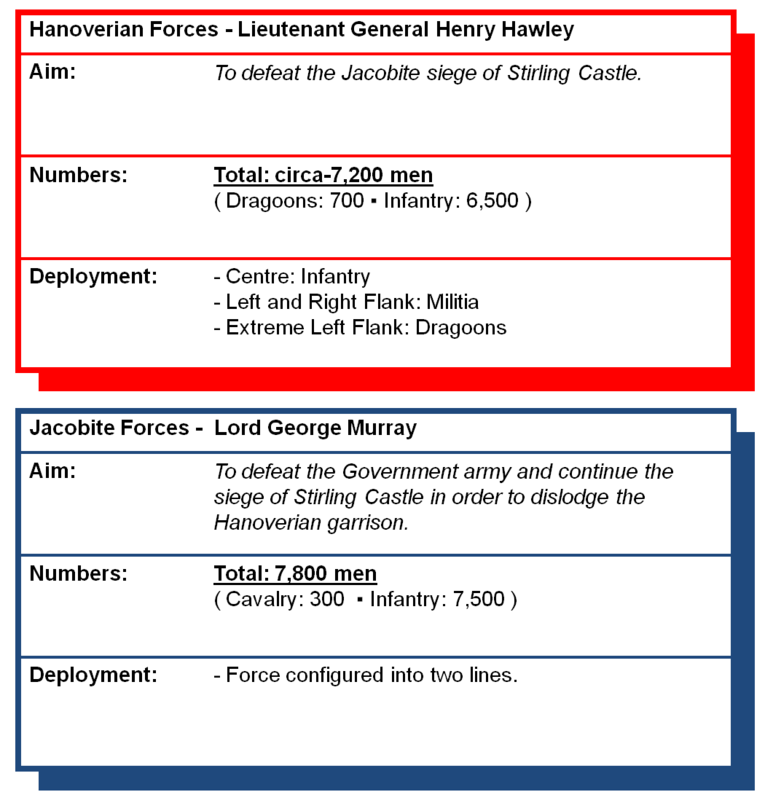 With the Jacobite force having beaten the Government troops to the summit and now configured in full battle order, Hawley's priority was to prevent them charging before he had fully deployed his own forces. Accordingly he ordered his Dragoons to charge the enemy line unsupported. Unsurprisingly the Dragoon charge, against the formed Jacobite ranks, was unsuccessful. Faced with a fierce barrage the Dragoons broke and retreated down the hill disconcerting the Glasgow militia that was still ascending. If Hawley had hope his Dragoons would buy him time, he was to be disappointed. Having depleted their ammunition repelling the mounted troops, the Macdonalds charged the Government left wing seemingly without waiting for the order. 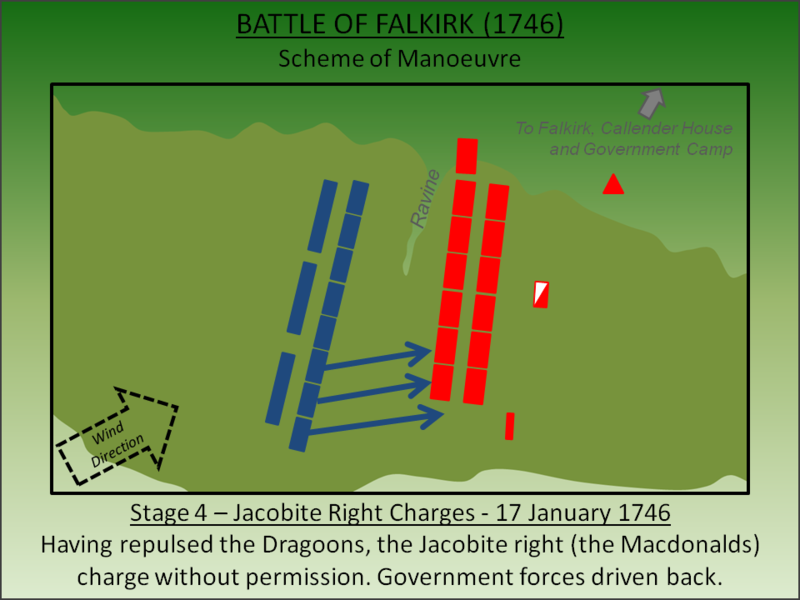 The Government soldiers, with their powder soaked, could not fire an effective volley and were soon in hand to hand fighting with the Jacobites where they were at a distinct disadvantage (see note on Highland Charge below). 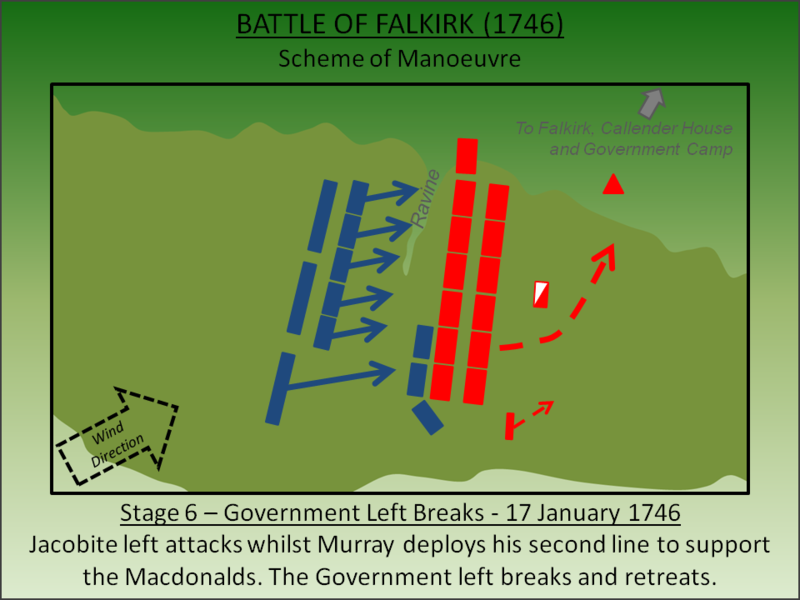 Seeing that his forces were committed, Murray sent his second line into the fray which led to the Government forces on the left breaking and fleeing down the hill. On the Government right things were faring a little better for Hawley. The steep ravine had provided some protection whilst the poor visibility had led to the misalignment of the two armies; accordingly Hawley’s force had the superiority in numbers on his left flank (at the expense of the right). His troopers managed a more effective volley here and held their ground aided considerably by the ravine. 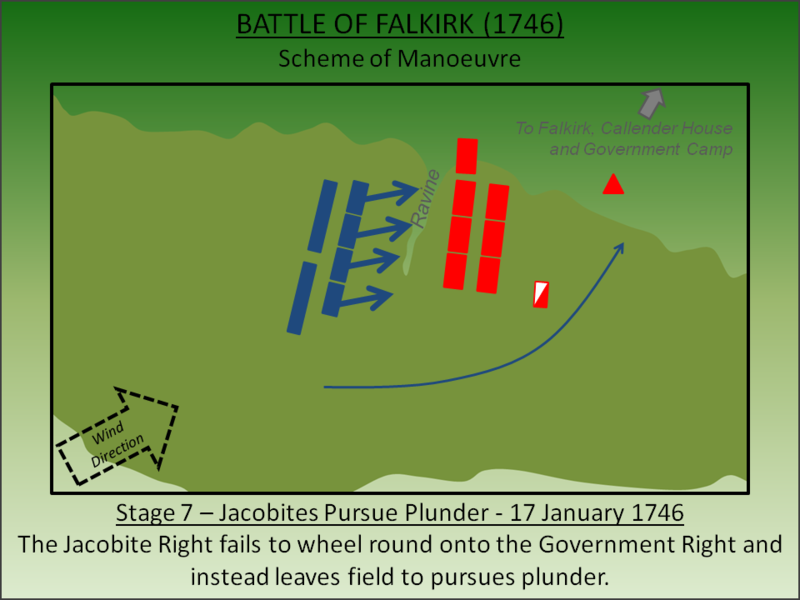 Furthermore the Jacobites, who had so successfully broken the Government left, pursued those troops towards Falkirk hopeful of plunder rather than wheel round to attack the Government right. The short January days meant the daylight was now fading preventing further action and Hawley withdrew his remaining forces back down the hill and onwards to Edinburgh. He had suffered around 300 casualties with perhaps a similar number also captured. The battle was undoubtedly a Jacobite victory but they were unable to capitalise on their success. The Government forces were able to withdraw to Edinburgh without significant loss and were soon able to augment Cumberland’s force. The Jacobites abandoned their siege of Stirling Castle and retreated further north into their Highland strongholds aiming to dislodge the Governmental garrisons along the Great Glen and re-new the campaign in the Spring. Inverness Castle (Fort George) and Fort Augustus both fell at this time but with Cumberland's force in Aberdeen a reckoning was inevitable. On 16 April 1746 the forces clashed at the Battle of Culloden where the Jacobites army was routed. The bulk of the Jacobite force was drawn from Highland clans who were traditionally armed with muskets, broadsword and a small round shield (the targe). Their famous ‘Highland charge’ was a fast assault on the enemy position with them firing muskets at close range, dropping their firearm and then engaging with broadsword. It was an effective tactic that worked well especially as the Government bayonets could be easily deflected by the Jacobite targe. 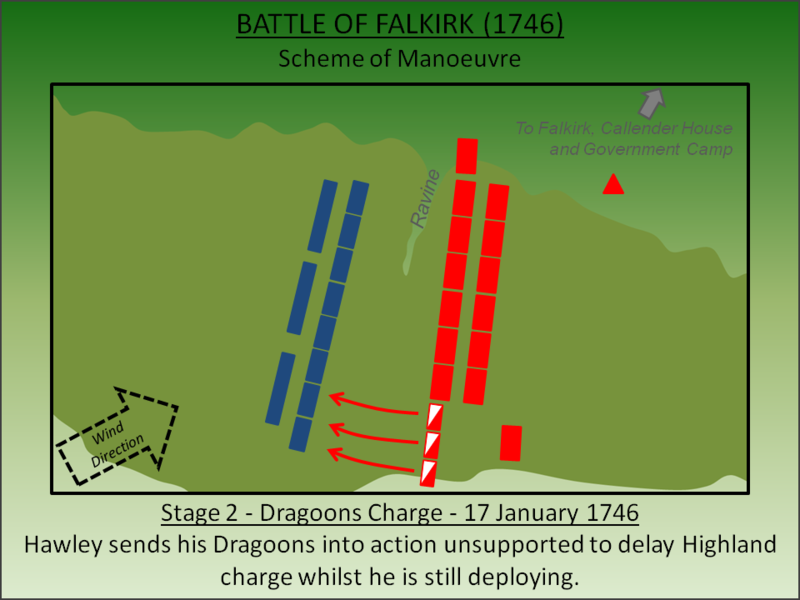 At Falkirk General Hawley had relied upon the speed of which his seasoned troops could fire volleys of musket shot to defuse the effectiveness of the Highland charge. However, after having climbed the steep hill to Falkirk Muir the Government army was soaked and much of their powder damp. Only the feeblest of volleys was achieved which was one of the reasons why the Government left flank broke so easily. The right flank, which held against the charge, benefited from a deep ravine in front of their position. By April, when the Battle of Culloden was fought, Government troops had been drilled in a new tactic for hand to hand combat with the Jacobites. Working with their neighbour they were required to always stab to the right no matter what was coming directly at them significantly reducing the effectiveness of the targe. Lancaster, J.H.D (2015). Falkirk: Battlefield visit notes and observations. CastlesFortsBattles.co.uk. The site remains largely undeveloped although is now partially woodland which reduces visibility of the battlefield plain. A monument marks the site of the battle. Monument. The monument can be found on Greenbank Road approximately where the Government Right flank was located. Targe (Shield) and Dirk (Dagger). Examples of weapons used by the Jacobites which were, until the Government troops developed an effective defence at Culloden, formidable weapons. These items are on display at Broughty Castle near Dundee. The monument is easily found on Greenbank Road. A number of small lay-bys nearby provide parking for one or two cars.